Traditional assessments do not work for everyone. Non-native English speaking students and those with disparate cultural experience, learning capabilities, previous education, and socioeconomic backgrounds, may struggle with test formats and content. 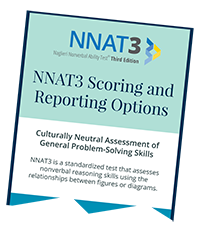 The Naglieri Nonverbal Ability Test® (NNAT®) is the research-based solution for these problems― an assessment that provides neutrality, quality, and reliable data, scoring, and reporting that educators need, and students deserve.